SecureVPN helps people stay private and feel the freedom of Internet. Our apps are available for all major platform and provide secure unlimited access to any website or app from any location. Happy users can enjoy watching videos, unblock services like Facebook, YouTube, Skype, WhatsApp, etc., download programs without restrictions at home, work, studies and while traveling. Moreover, SecureVPN hides IP address, therefore web-surfing becomes anonymous and private. More than 1000000 of users have already installed SecureVPN. - Anonymous web-surfing: IP address and identity are hidden. - Websites unblock: ability to browse media, films, YouTube, social networks like Facebook, Google+, Twitter, Instagram, download necessary programs and more without any restrictions at home, work, studies and while traveling. - Unlimited access to VoIP, video calls and messaging services: ability to Viber, Skype, WhatsApp, IMO, Facebook Messenger without worrying about privacy. - Wi-Fi Security: VPN encrypts Internet connection and protects data while using public Wi-Fi hotspots all around the world. 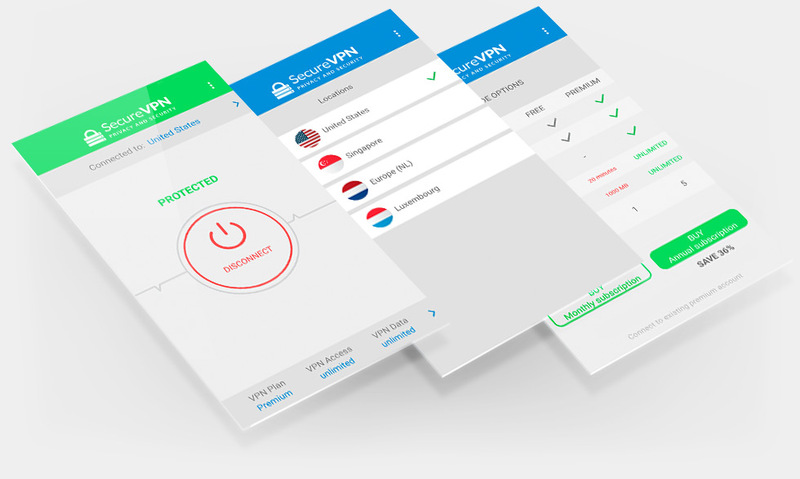 - Data & Privacy Protection: military grade of VPN connection encryption gives the new level of online security and provides prevention from hackers robbery of confidential information. - Easy switching between countries: ability to choose the country, where to surf Internet from. - Simple button that turns VPN connection on and off.